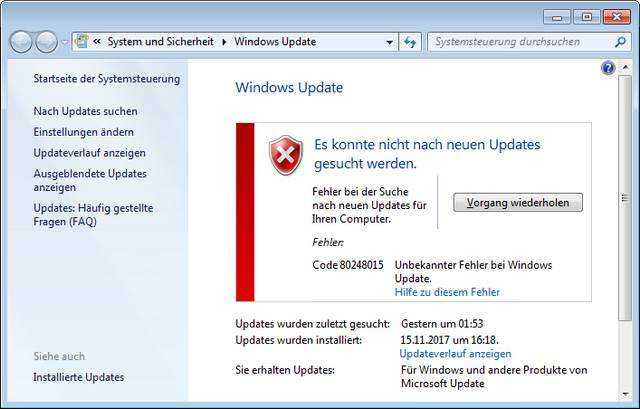 [German]Since December 4, 2017 the Update Search in Windows 7 (and Windows Server 2008 R2) has been broken. But Microsoft has provided already a fix. For those affected, I briefly document within this blog post what you should know and what you can do to fix the issue, if it’s not repaired automatically – or if you lost some update options. Microsoft forgot the renew a file Windows\SoftwareDistribution\AuthCabs\authcab.cab in Windows 7 Update, that sets an expire date December 3, 2017. From December 4, 2017 the Update Search in Windows 7 (and Windows Server 2008 R2) failed (see screenshot below) with error 0x80248015. Or Windows 7 refuses to search automatically for updates and shows the windows below. Clicking Seach for updates ends with a notification, that the service could not be executed. I’ve documented that issue within my blog post Windows 7: Error 0x80248015 in Update Search (Dec. 4, 2017). Microsoft has released a fix for this problem, so the update search should work again. 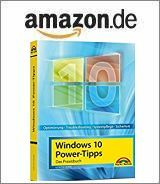 However, it is possible that users may have to make manual steps, to repair Windows Update search. Try to execute the following steps. The screenshots are in German, but I guess, also users of other languages should be able to identify the right options. 1. Open Update search via control panel. The update search won’t find anything, so click to the Hyperlink More information marked with a red arrow in the image above. Note: It’s important, that Internet Explorer 11 is the default browser. On my system it was Slimjet, which won’t work. 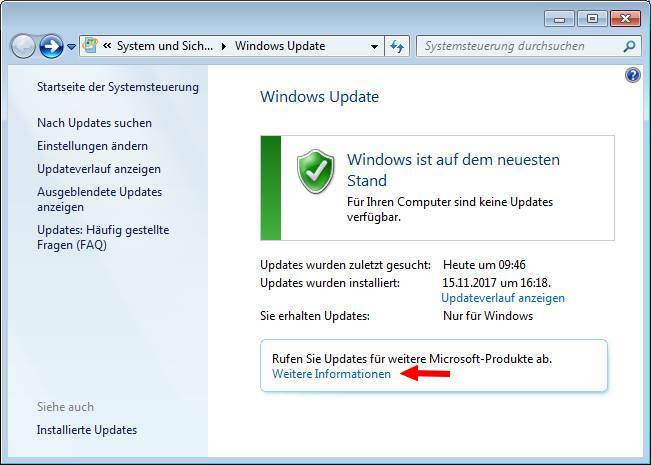 In this case launch IE 11 and enter this URL http://www.update.microsoft.com/windowsupdate/v6/ . 2. 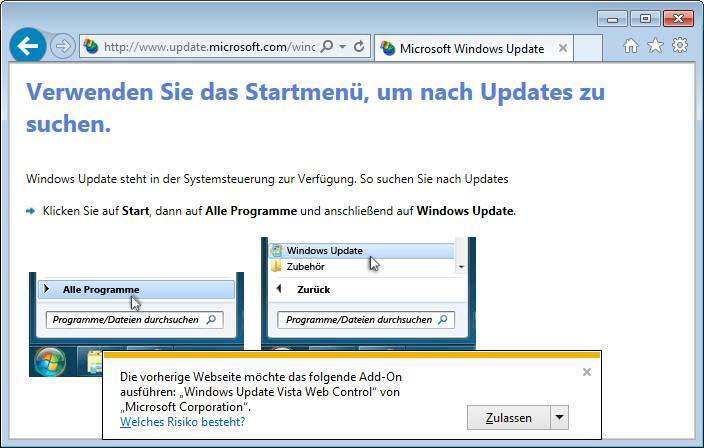 Allow the installation of Windows Update Vista Web Control in IE 11 via the button Accept (or similar). 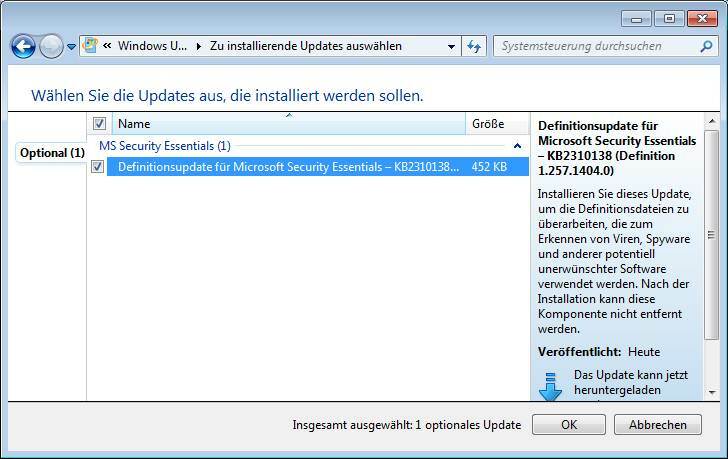 If you start an update search, new updates should be detected (here a definition update for Microsoft Security Essentials). I’ve posted a workarounds in my blog post Windows 7: Error 0x80248015 in Update Search (Dec. 4, 2017) to fix the update search. Just disabling the search for updates for other Microsoft products fixes the search. But this workaround had the side effect, that the lower two options in Windows Update was missing afterward (see below). To fix this issue, try the following steps. 1. 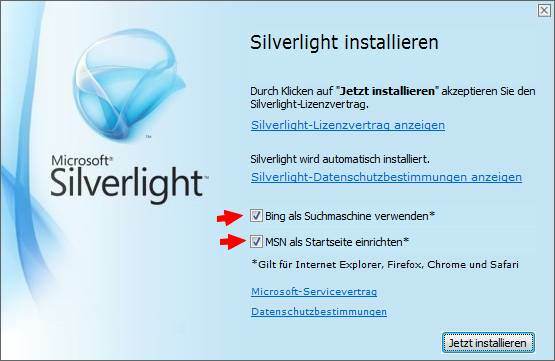 Open a browser and got to Microsoft’s webseite for Silverlight and select the button to install Silverlight. 2. 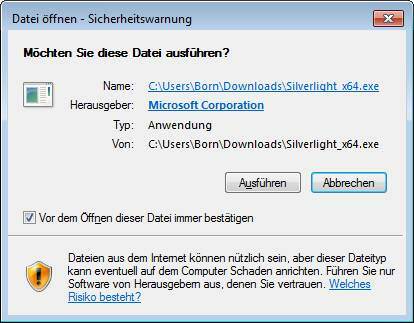 Select the installer Install for Windows and download the Silverlight installer (here Silverlight_x64.exe). 3. 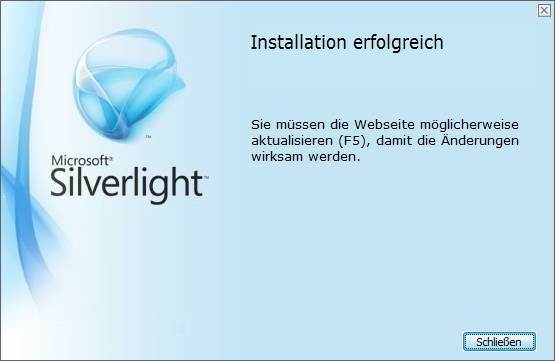 Execute the Silverlight installer and confirm the security warning and user account control warning. 4. 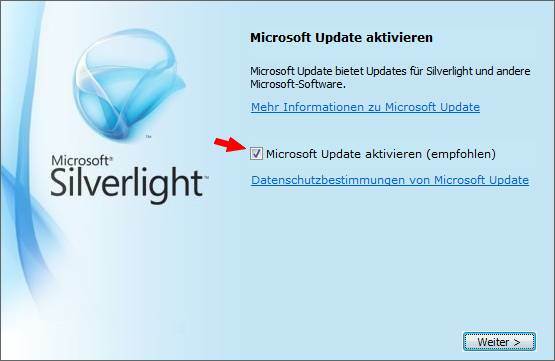 Uncheck in the Silverlight install window the two options marked with red arrows and Click the Install button. 5. 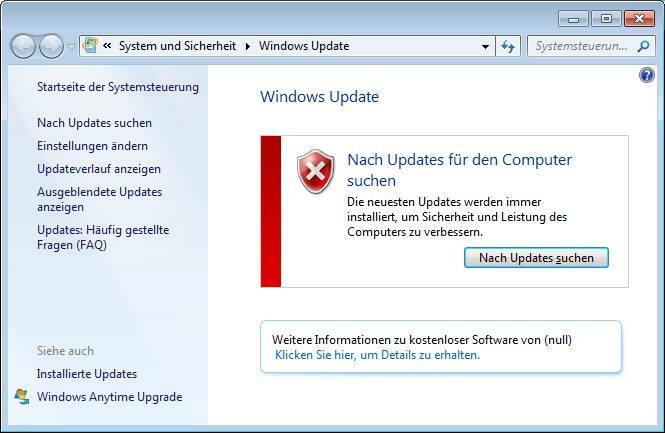 Check Microsoft Update activate checkbox and click Next. This option causes the missing options in Windows Update to become visible again, because Silverlight needs them for its own updates. As soon as the above message appears, exit the window via the close button. As soon as you call the update settings in the control panel, all options should be displayed again. 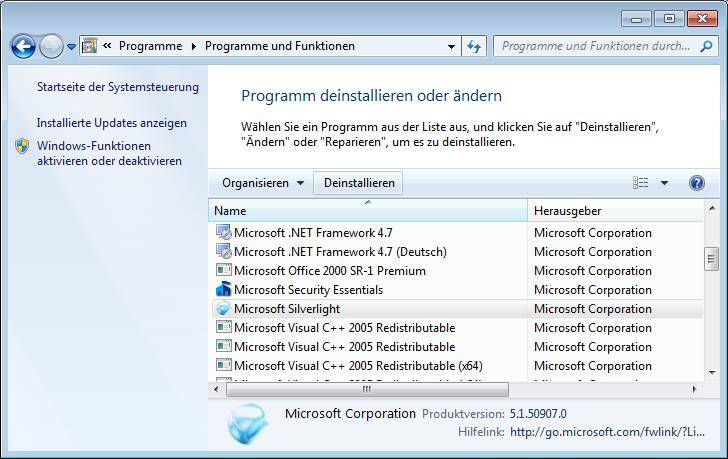 Select the option to search for Microsoft products. Then it’s all back to normal, . 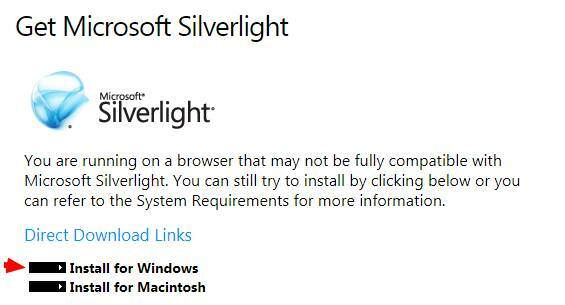 Afterwards, go to the Control Panel, select Uninstall program and in the Programs and Features window, uninstall the Microsoft Silverlight program. This entry was posted in issue, Update, Windows and tagged Error 0x80248015, fix, Windows 7. Bookmark the permalink. I imagine that this patch is for those people who want to update without waiting for Microsoft to fix the problem of the renewal of “Windows \ SoftwareDistribution \ AuthCabs \ authcab.cab”. Once Microsoft renews that file, nothing will have to be done to update, right? The new updated file that fixes the problem should be dated 12-4-2017.